This is a both a completely horrible photo, and an example of why I love the camera RAW format. I did not check my exposure settings before taking pictures of this guy, and ended up with a card of pure-black trash. This is not an ideal photo of course, but I was able to salvage this from seemingly nothing. Fancy stuff. Anyway, this is a California Kingsnake (Lampropeltis getula californiae) from North of Wickenberg. I’ve never seen one out in the daylight hours before, and this one was big, fat, and quite aggressive. 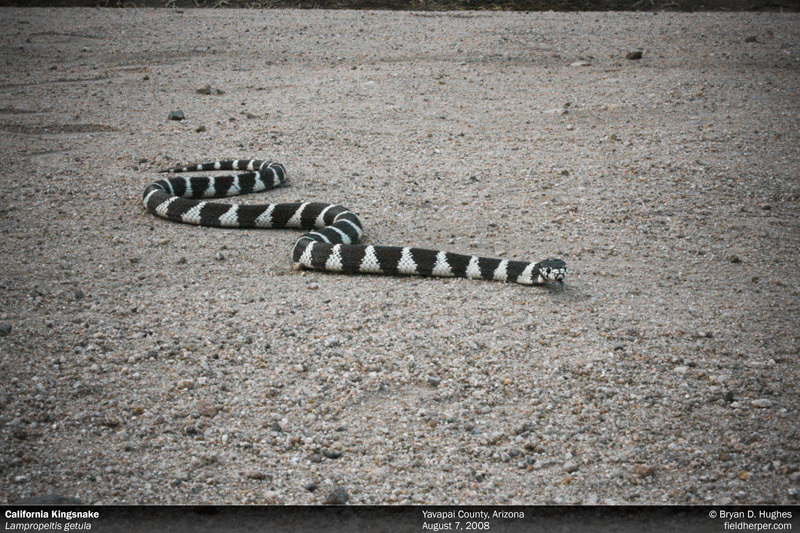 This entry was posted on Tuesday, March 17th, 2009 at 9:27 pm	and is filed under Equipment, Field Herping, Photography. You can follow any responses to this entry through the RSS 2.0 feed. You can leave a response, or trackback from your own site.